PA negotiator claims a freeze on Jewish construction in Judea and Samaria is an Israeli obligation, not a condition set by the PA.
An official with the Palestinian Authority claimed on Wednesday that a freeze on Jewish construction in Judea and Samaria was an Israeli obligation, not a condition set by the PA.
"We are not placing any conditions on the resumption of negotiations," PA negotiator Saeb Erekat told AFP, after French President Francois Hollande called for a resumption of peace talks without preconditions between Israel and the PA.
"Our demands are not conditions; we are merely asking that Israel honor its commitments, beginning with a settlement freeze and the release of Palestinian prisoners,” he said. "We appeal to Netanyahu to say very clearly to us and to the world that he is committed to the principle of a two-state solution based on” the pre-1967 borders. Abbas has constantly imposed preconditions on peace talks, demanding that Israel accept the indefensible pre-1967 lines as final borders, release all Arab terrorists from its jails, and halt construction in Judea, Samaria and east Jerusalem for a second time before talks begin. At the same time, he has refused to recognize Israel’s right to exist. Rather than talking to Israel, Abbas has preferred unilateral moves, such as asking the United Nations General Assembly to grant it "super-observer" status that could give it access to UN institutions and agencies. 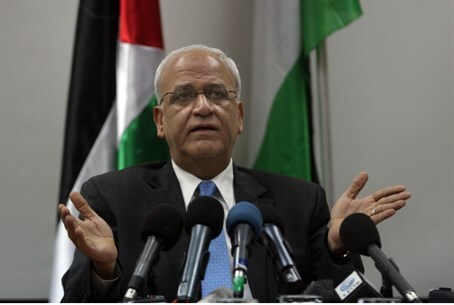 The PA Chairman has claimed that the UN bid is not a substitute for peace talks and said the PA is ready to resume negotiations with Israel after it is recognized by the UN. Erekat’s comments came after Hollande held talks with Netanyahu in Paris on Wednesday, his first with the Israeli Prime Minister since taking office five months ago. At a joint news conference afterwards, the French president called for a resumption of peace talks without preconditions.